So to take a short break from religion bashing, which is not to say religion shouldn’t get the drubbing it deserves, but the New Enlightenment is much more than the diminishment of religion and the expansion of human rights, it’s also about the exponential advance of human knowledge: science. There are decades, millennia even, of speculation about human nature from both philosophy and religion, especially with regards to our unique cognitive abilities. We are at a point in time of our species development and science advancement that we can make some more enlightened hypotheses about how our unique cognition evolved. The info and the ideas and eventually the answers will come from archaeology, paleo-anthropology neuroscience, developmental and cognitive psychology. The answers won’t be found in philosophical or theological pronouncements drawn from a new interpretation of scripture or reading of Plato. 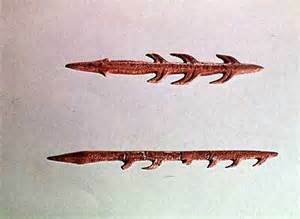 I chose the above sample of Paleolithic Cave Art quite deliberately. 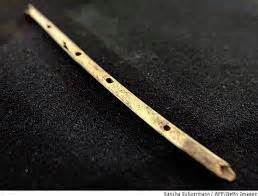 It represents some of the recurrent themes found in the Paleolithic Art stemming from roughly 40,000 years ago until 10,000 years ago, much but not all of it in Ice Age Europe. First, it depicts an Ice Age mammal; an object of intensive Ice Age hunting. And it is wounded, with its intestines spilling out from a gut-wound. The vast majority of the paintings are the hunted mammals: aurochs (ancient cattle), ibex, horses, deer, bears, lions,rhinos, reindeer, elk… There are few depictions of birds (and usually in the context of hanging around mammals as is the image above) no flowers, bees, landscapes, pots, hearths, a few fish and only the kinds like salmon you can catch and eat. No family scenes, a few wolves and foxes but no mice, rats, insects, clothing, and only a few sketchy images of people, like the stick figure of the fallen hunter with his spearthrower (atl-atl) nearby. So the vast majority of the Ice Age art scenes are the hunted mammals, often wounded and portrayed with excellent anatomical, even seasonal detail, with correct postures when running, lying down, charging, reacting to being wounded by a spear, etc., in exquisite detail that any artist will tell you requires hours of intense observation and practice. 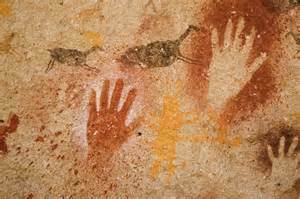 What the coffee table books and art exhibits don’t show you is the large amount of incomplete and less skilled and poor, even bad drawings that are found throughout the caves and rock shelters as well. There are plenty of amateurish, even botched depictions of animals. 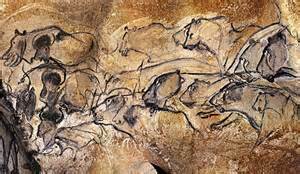 Not everyone had the skills and perspective of the artist who produced the exquisitely drawn lions from Chauvet Cave in France, above. 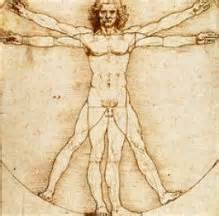 In the rare case a human is depicted, it is likely to be a stick figure, or a roughly drawn profile. 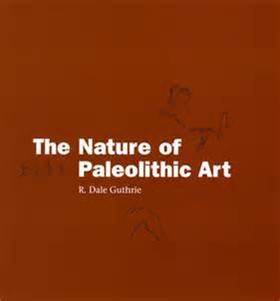 R. Dale Guthrie’s The Nature of Paleolithic Art (2005). University of Chicago Press. Guthrie makes a formidable case and has a rather unique perspective: he is a biologist, a hunter, an artist and is very knowledgeable about extant and ice age mammals and the lifeways of northern aboriginal hunting cultures. If you have any interest in the subject and would like a refreshing change from the predominantly shamanistic/spiritual interpretations of Late Paleolithic Art, get a hold of a copy. 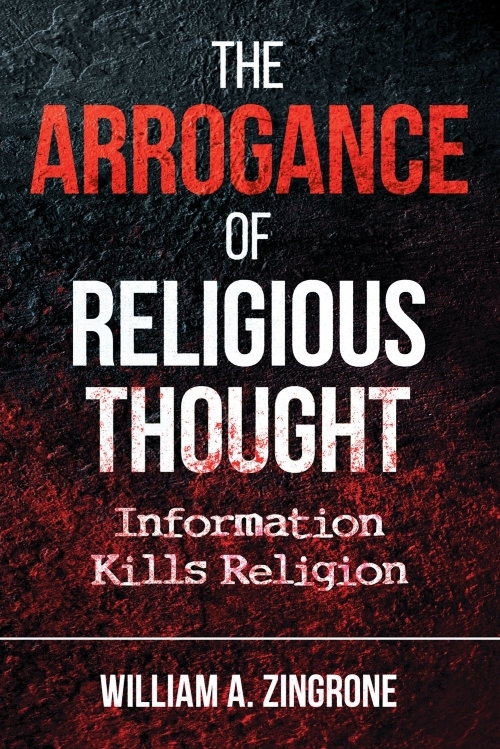 Whether you like his rather mundane and practical conclusions, you will benefit from the wealth of data and depictions that you will not find in the spiritual treatises or coffee table books. 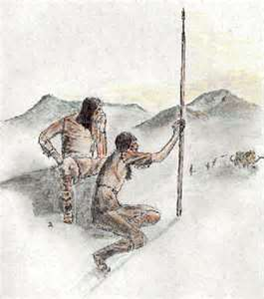 Maybe the Ice Age Artist/Hunters didn’t pay attention to each other the way we would take for granted nowadays. Maybe they didn’t gaze into their mates or infants eyes and think to study and burn into memory the contours and the spaces like they may have done with their mammal prey as a consequence of long hours lying in wait or stalking, observing their quarry. Maybe they didn’t think to study each other, the human face, the human form like DaVinci or countless other artists from the Renaissance and beyond, and maybe given their demanding subsistence lifestyle: they didnt have time. Maybe they had no time to study a person or a bowl of fruit for the hours and hours required to obtain the same intimate knowledge they displayed in drawing their quarry. Drawing classes teach you to pay attention to the spaces. To get a still life or a portrait right you not only have to depict the features right but you must get the spaces between correct or the proportions are all wrong and easily seen as out of whack. Some of the Ice Age hunters with a bit of artistic talent may have developed that skill in the long hours of stalking and tracking. 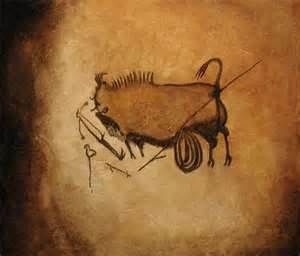 Paleolithic art also displays the formidable knowledge of the animals habits, postures, movements, even expressions. They knew their critters well, their lives depended on it. The Ice age artists were definitely preoccupied by male themes, hunted mammals, hunting scenes and female anatomy. Another preliminary thought: back to the spaces. To draw well, getting the spaces correct in size and relation is just as important as depicting the features. The Chauvet lions muzzles have to be drawn correctly and equally to get the incredibly accurate repeated images, but the spaces between their muzzles and their necks must be just as accurate and equalized. Putting a frame around a space, attending to the spaces is the first step in depicting them properly. Precise manipulation of space, production of equal spaces, evident in these carefully carved bone harpoons from the same time period. The Paleolithic artisans not only acquired intricate knowledge of their prey, and of bone, stone, wood and ivory but in the ability to represent that knowledge; they made good use of space. This entry was posted in Evolution, Paleoarchaeology, Psychology, Science and tagged Dale Guthrie, Stone Tools, The Nature of Paleolithic Art by waz. Bookmark the permalink.